Elena Panova is credited with having originated a new swinging trapeze style and technique, which she developed quite by accident at the State College for Circus and Variety Arts in Moscow, along with her teachers, Tereza Durova and Victor Fomine. When it was presented for the first time in the West in 1987 (it was at a time when communist Eastern Europe was still secluded), her act was a sensation that triggered the creation of a string of new swinging trapeze acts in a similar style, notably in Canada. Murom is one of Russia's oldest cities, dating back to the 9th century, and "home" to the Kievan Rus folk hero of yore, Ilya Muromets. It is also a Holy City that managed to keep some of its monasteries and convents open during the communist era. Yet, it is a small town, and although the Soviet government gave it a theater building, it didn't have a circus, neither was it important enough to receive the summer visit of a shapito (or chapiteau(French, Russian) A circus tent, or Big Top. in French). In fact, Elena never saw a live circus performance while growing up. She did see circus shows on television, however, and at age fourteen, she joined the local Amateur Circus Club—the Soviet equivalent of European or American youth circuses, though generally at a much higher level in terms of the training they provided. Amateur circuses flourished in the Soviet Union, where circus arts were held in high esteem. 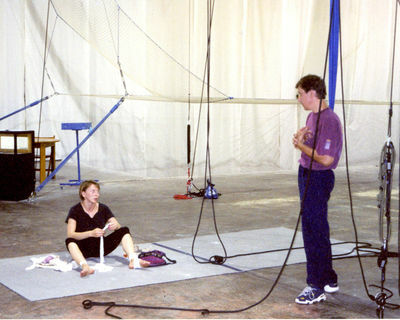 During these years, Elena trained in basic acrobatics, but her tastes drew her to aerial apparatuses; while still at the Youth Circus, she and a fellow student developed a "bambou(French - Russian: Bambuk) Aerial apparatus, generally a hanging perch, from where the performers hang with the help of hand or ankle loops. See also: Aerial perch." (aerial perchAn aerial apparatus, generally a hanging perch, from where the performers hang with the help of hand or ankle loops. (French: Bambou - Russian: Bambuk)) act. 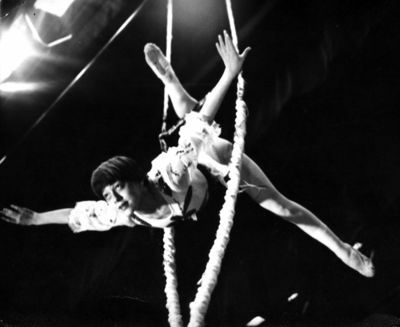 Her performance debut came in April 1978; she executed a static trapeze act in an Easter show the Amateur Circus staged in Murom’s Grand Theatre. Since she was bent on becoming a circus artist—and had the ability to succeed—Elena's coach suggested she apply to audition for Moscow’s famous State College for Circus and Variety Arts. She submitted the proper forms and documents and, to her surprise, was invited to audition in Moscow. She was seventeen and had never left Murom. Following a strenuous exam, Elena was accepted to the College—one of the few among hundreds of applicants from all over the Soviet Union. Over the next three years, she trained in acting, ballet, and all circus disciplines, eventually specializing in swinging trapeze. Even so, the creation of her act—an act that would redefine the swinging trapeze specialty—was the result of a fortunate stroke of serendipity. Although Elena wanted to do a solo trapeze act, the five-year plan then in effect did not call for new trapeze acts. In the Soviet Union, five-year plans were centralized methods of promoting economic growth through the use of quotas. The first Soviet five-year plan (1928) had called for the rapid collectivization of agriculture, a policy that was not revised even though it led to millions of deaths from starvation. In the light of this, there seemed to be little hope that Elena would get her new trapeze act as long as it deviated from the five-year plan in place. Nonetheless, she insisted on building a trapeze act. Perhaps tired of her recriminations, her teachers eventually caved in, and Elena was assigned a trapeze coach. The coach's husband then was offered a job in Paris with the Soviet Television, and his wife would not miss the opportunity to live for a time in France. Before leaving Russia, the would-be coach asked a friend, Tereza Durova—an act director who had recently joined the College staff—to take her place and create a swinging-trapeze act for Elena. Tereza Durova came from a famous dynasty of clowns and animal trainers and had never worked on an aerial act before. She asked another newcomer to the College staff, Viktor Fomin (known today as Victor Fomine, the French spelling of his Russian name)—a former competition gymnast who had performed in a horizontal bar act—to take on the technical aspects of the act. To Fomin, who complained that he had never worked on an aerial act before, Durova is famously remembered to have said, "A trapeze is a bar hanging from two ropes. Go to the school library and read every book you can find on the subject!" Durova, Fomin, and Panova spent three years developing Elena's act at the College. Fomin and Elena struggled to realize Durova’s often far-stretched ideas. They experimented with various techniques to try to achieve them, and in doing so, eventually came up with new tricks; some were found by sheer luck, others by trial-and-error. When it was all done, Elena Panova’s act didn't look like anything that had been seen before. Performed entirely in full swing, it included pirouettes between the ropes caught by the ankles, and half-pirouettes caught by the heels, all done without interrupting the swing or having it re-energized by an assistant. Furthermore, Elena's act was not conceived around the notion of danger, but around the aestheticism of movement. It was a seductive ballet, danced in space (eventually, in 1987, to the accents of Vivaldi’s Four Seasons—this at a time when classical music was still a rarity in the circus). The act was first performed in 1985, in a show presented by the Moscow Circus in Phnom Penh, Cambodia, which marked Elena's professional debut. Two years later, her act emerged as the great revelation of the Festival Mondial du Cirque de Demain in Paris: In that landmark edition of the Paris's Festival, the sea-change underway in the contemporary circus became apparent for the first time. In 1988, Elena won the All-Union Circus Competition of the USSR, which was arguably, at the time, the world’s most difficult circus competition. From 1985-90, she performed in the Soviet Union and toured with various units of the Moscow Circus in Mongolia, Cambodia, Vietnam, France, Belgium, Austria, Germany, and Israel, before becoming an independent contractor in 1991, after the fall of the Soviet Union. Elena's first independent engagement came in 1991, with the Big Apple Circus in the United States. She subsequently appeared in some of the world’s leading circuses on four continents, including Circus Knie in Switzerland and the Cirque d’Hiver-Bouglione in Paris. She has performed her act under the nave of the Cathedral of St. John the Divine in New York and at the Victorian Arts Festival in Melbourne, Australia, where she has also been featured in a musical, Amore. In 1983, while still at Moscow's Circus College, Elena had married the clown Sergei Panov. Their respective careers quickly pulled them apart and they divorced in 1990. Although she settled in the United States in 1993, Elena continued to perform around the world, mostly in Europe. Her performing career lasted nineteen years: She retired from performing in 2004, after a last tour in the People's Republic of China. She has since become an aerial teacher in San Francisco, California, where she has coached several professional aerialists, as well as many recreational students. She is married to circus historian Dominique Jando. Elena has sat on the Jury of the Festival Mondial du Cirque de Demain twice, in 1997 and 2014, for the Festival's 20th and 35th anniversaries respectively. She is featured in Le Dictionnaire universel des créatrices (Paris, Editions des femmes, 2013), a project supported by the UNESCO, as the creator of a new trapeze style.